Spacious, user-friendly, and feature-rich, tents for camping are made for a relatively luxurious experience in the outdoors. Many of these behemoths offer enough room to set up cots or even chairs and a table for card games on a rainy day. The majority of car campers take only a few trips a year, usually during the peak summer months, and even the cheapest tents on this list will perform well for this type of use. For tougher weather conditions or as a long-term investment, consider springing for a better-built and more expensive model. For more information, see our comparison table and buying advice below the picks. To complete your kit, we’ve also written about the best camping sleeping bags and mattresses. Weight: 21 lb. 6 oz. What we like: Spacious and can be divided to create separate rooms. What we don’t: Super tall construction isn’t ideal for windy weather, although the new pole design helps. For a quality build from a company that knows a thing or two about camping, the REI Co-op Kingdom is our top tent of 2019. Most importantly, you get a ton of livable space and just about all of the features we look for. The hubbed pole design creates near vertical walls, so the peak height of 75 inches is enjoyed throughout most of the tent (traditional dome-style tents are only roomy in the very middle). Further, the Kingdom has been thoughtfully designed with plenty of interior storage, a center divider to create separate rooms, large doors on both ends, and a rainfly that is one of our favorites on the market. The REI Kingdom was updated for 2019, so what changed? The floor area and peak height remain the exact same, but you get a studier pole design, more mesh for better stargazing, an even more customizable (and brighter) rainfly, and a price increase of $30. For those who want additional space, REI is now selling a new “Mud Room” for $100 and a larger “Porch” for $199. We liked the old “Garage” attachment for the Kingdom, which was more or less a combination of the two, but both options offer added coverage to suit various camping needs. Weight: 11 lb. 11 oz. What we like: High-quality construction and enough tent for most campers. What we don’t: Not as storm-ready as the Marmot Halo. The livability of the REI Kingdom above is tough to beat, but Marmot offers another quality set-up in the Limestone. This camping tent includes ample space for four, is easy to pitch, and reasonably weather resistant thanks to a full-coverage rainfly and taut DAC pole design that stands up well to moderate wind. And while the peak height of 61 inches on this four-person dome-style tent isn’t anything to write home about (the higher capacity versions have taller ceilings), the poles effectively stretch the walls outwards to create a roomier-feeling interior. It’s true that the Kingdom 4 is taller and more spacious, but the Limestone costs $40 less and is a better performer when the wind picks up. For those who camp only on warm summer days, which is a high percentage of folks, the Limestone is ideal. Its mesh-heavy design, vents, and near vertical walls make it comfortable even with the fly on. That said, those looking for an even more storm-ready design should check out Marmot’s Halo. 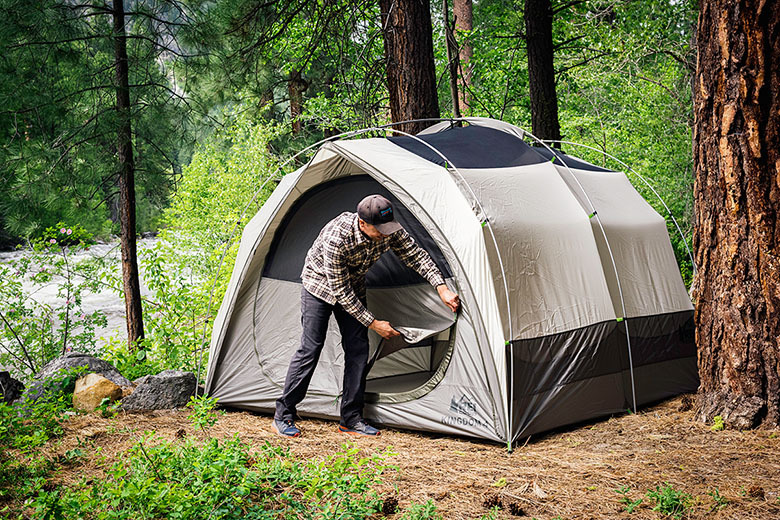 This tent has a beefed-up pole structure and less mesh in the tent body that adds about 1.5 pounds in weight and $100 to the price tag, but it will stand up to the elements much better. In the end, both are solid options from one of our favorite camping brands, but the Limestone gets the edge as a great value for fair-weather campers. Weight: 16 lb. 10 oz. What we don’t: Questionable build quality and limited rain fly. Realistically, a healthy number of people only go camping once or twice a summer in good conditions, and don’t need all the bells and whistles of the tents above. If this sounds like you, give serious consideration to the Sundome 6 from Coleman, which isn’t made from the fanciest fabrics but likely will got the job done. Most importantly, the price that's often around $90 is a steal compared to some of the fully-featured tents on this list that are five times that much. What do you sacrifice by going with such an inexpensive tent? We've found the materials feel pretty cheap, including everything from the clips and poles to the tent walls. Also, the rain fly covers the main portion of the tent body but leaves part of the sides exposed. This shouldn’t be an issue in most conditions, but we do prefer full coverage for serious rain and blowing winds. 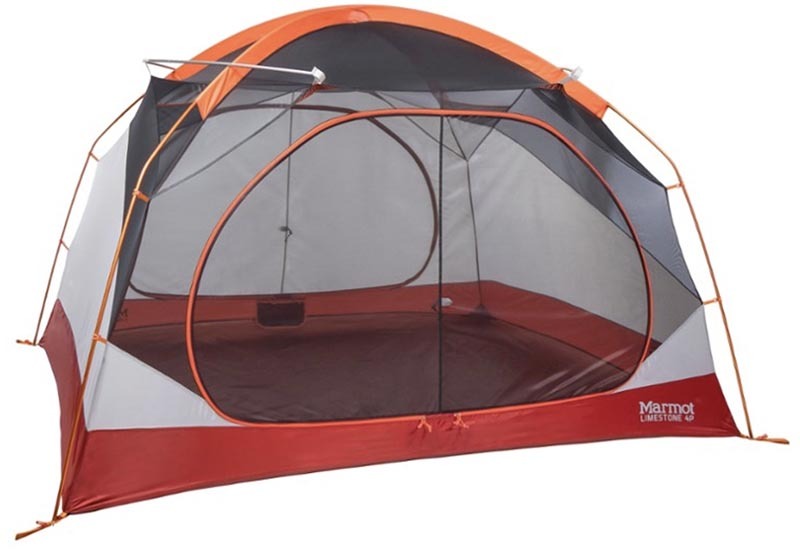 However, the roominess, durability, and weather protection all exceed what we would expect at this price point, which is why we have the Sundome so high on this list. Floor area: 37.3 sq. ft.
What we like: A functional and relatively easy to use rooftop tent system. What we don’t: Expensive, heavy, and bulky. Rooftop tents have gone from niche to mainstream in only a few short years. 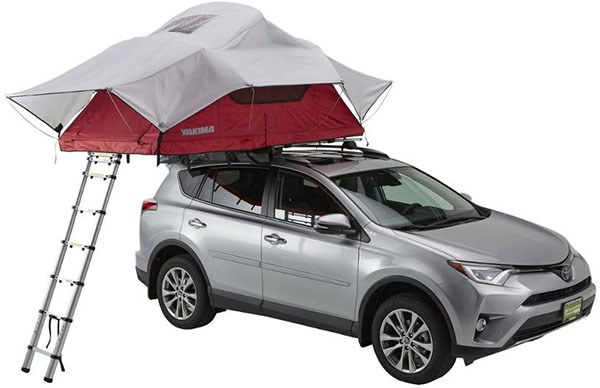 The appeal is obvious: a tent attached to the roof of your car expands camping and road tripping opportunities exponentially, not to mention you’re sleeping elevated off the ground. Tepui makes a number of premium options—the tough Kukenam Ruggedized is particularly impressive—but we think Yakima’s SkyRise offers the right combination of price, usability, and weather protection. The three-person model is comfortable inside with an integrated foam mattress, set up is relatively simple (watching Yakima’s online videos will help), and the strong aluminum poles and full coverage rainfly perform admirably in rough conditions. The biggest impediments with a rooftop tent of any type are the associated cost and bulk. At $1,500, the Yakima SkyRise 3 is one of the more affordable fully waterproof models, but the price doesn’t include a roof rack system (you may need to upgrade from the standard rack included with your vehicle). In addition, the tent sits on top of your car (or pickup bed) and takes up most of that space, so there’s no room for attaching skis, bikes, or a roof box. But with the ability to set up camp just about anywhere, the unique SkyRise gets a spot on our list for 2019. Floor area: 58.7 sq. ft.
What we like: Great crossover camping and backpacking tent for families. What we don’t: $30 price jump from the previous model. 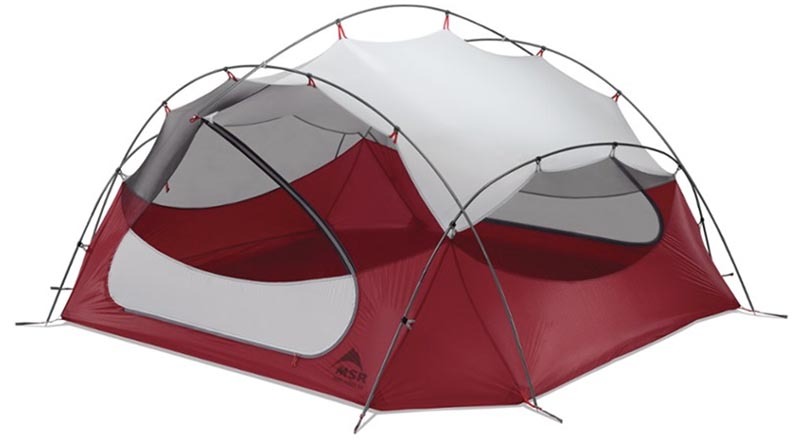 REI redesigned its signature Half Dome line last year with a big emphasis on interior space. To start, they now only offer “Plus” versions, which traditionally were longer and wider variations of their standard-sized models. The other major change was a new pole design that stretches the walls to be nearly vertical, giving the interior an even more open and airy feel. And good news for those who have owned previous editions: the current Half Dome retains the build quality, durability, and feature set that has made it a long-time favorite. One downside of the Half Dome 4 Plus is that it costs $30 more than the old four-person option, which puts it in the same ballpark as REI’s Kingdom 4 ($399) above. If you strictly plan on car camping, we recommend spending up for the Kingdom’s superior livable space and easier entry/exit. But for families that want a single tent for camping and backpacking—at less than 8 pounds, it’s easy to divvy up the carrying duties—the Half Dome 4 Plus is an excellent option. Floor area: 90 sq. ft.
What we like: A very strong, weather-worthy design. What we don’t: Heavy and doesn’t have as much usable space as the REI Kingdom. 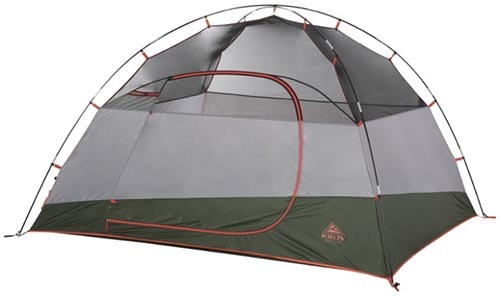 For camping in rough weather, Cabela’s Alaskan Guide Model is a proven winner. With a strong six-pole hexagonal design, full-coverage rainfly, thick polyurethane floor and fly coatings, and tough fabrics, the tent is capable of handling brutal wind (it’s rated for 50 mph gusts), rain, and even snow. Importantly, it’s also comfortable in mild temperatures and rich in features. Mesh vents and windows can be opened to encourage airflow, the front vestibule is generously sized, and you get enough pockets along the interior to keep gear organized. The REI Kingdom above has better organization and more mesh for warm weather, but the Alaskan Guide is the better option for hunkering down in a storm. 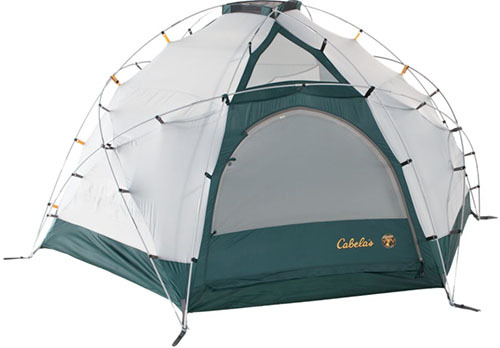 What are the downsides of Cabela’s Alaskan Guide tent? First, its hexagonal floor design doesn’t use space as efficiently as the tunnel-shaped Kingdom. Further, at this $450 price point, we’d prefer to see it offered with aluminum poles rather than fiberglass. The tent’s burly construction should limit durability issues, but fiberglass is more prone to breaking under stress than aluminum (it’s worth noting that Cabela’s does sell replacement poles if you need them). The Alaskan Guide also is very heavy at 33 pounds, but it’s a reasonable tradeoff if you need a weather-worthy build for 4-season camping adventures. Weight: 11 lb. 7 oz. What we like: Good price and a nice overall design. What we don’t: One door and thin, delicate materials. Kelty’s Discovery line offers a competitive mix of features for value-oriented campers. 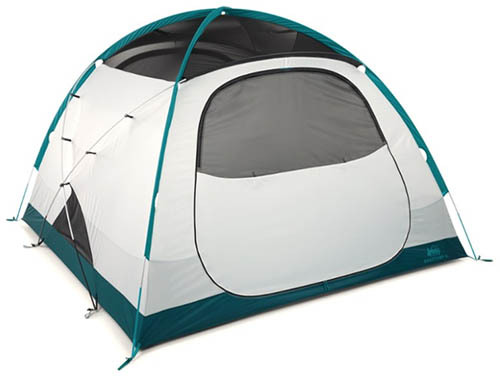 At $150 for the four-person model, it’s affordable but includes a number of upgrades from cheap tents like the Coleman Sundome above. First off, you get a full coverage rainfly and vestibule for rainy and windy conditions. Kelty also uses quite a bit more mesh in the construction so the tent makes it easier to keep cool in the summer heat. We would prefer a second door for easier access and more storage, but it’s not a deal breaker at this price point. For those looking to step up from a Coleman tent, the Discovery is a nice option. 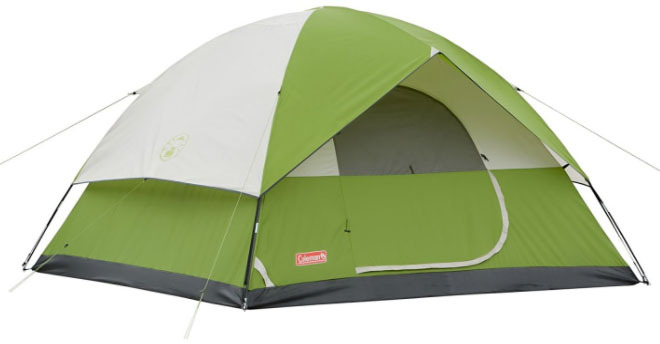 However, it’s still a relatively cheap build—the tent body and floor fabrics are thin and lower in quality than the REI and Cabela's models above. 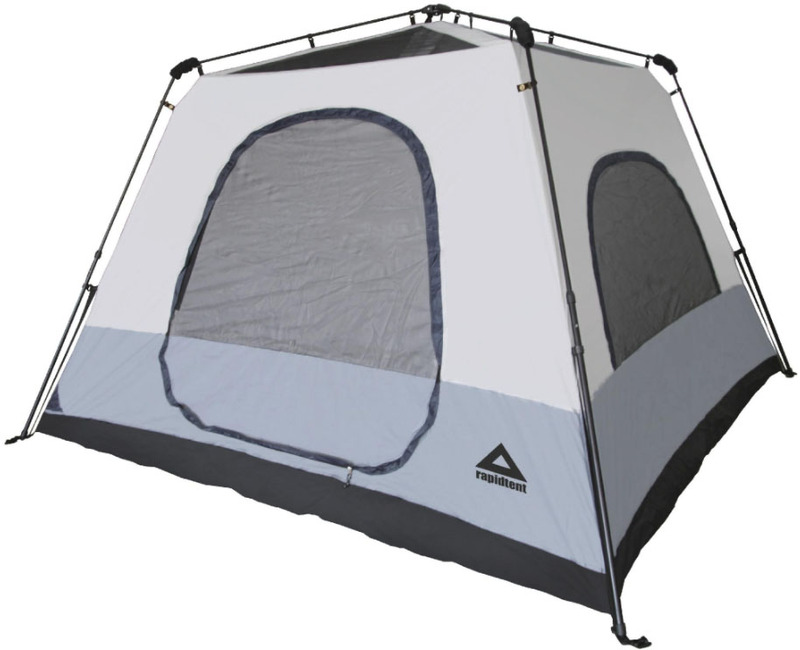 Additionally, the tent is short at 4 feet 9 inches and uses fiberglass poles, which don’t hold up well to rough use. But these are sacrifices we’ve come to expect at this price, and the Discovery remains a good mid-range option. Weight: 20 lb. 10 oz. What we like: Sturdy structure, ease of use, full coverage rainfly. What we don’t: Not as roomy as the Kingdom 6. The Base Camp from REI is the sturdier cousin to our top-rated Kingdom tent, and shares the same excellent mix of quality materials, organization, and design features. The dome shape means the walls aren’t as vertical as the Kingdom, but with an updated pole structure for last year, it’s still very easy to move around inside. 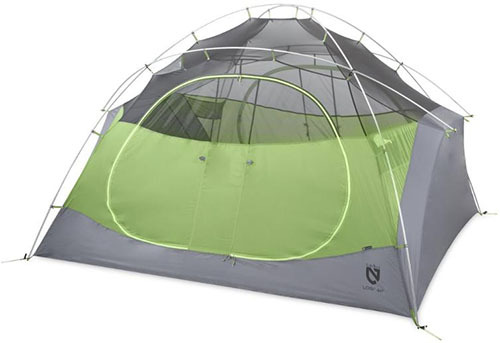 Other notable changes include more mesh along the tent body and additional rainfly vents, which address some of the airflow issues of the prior model. Importantly, the Base Camp remains a strong performer in the wind with its overlapping five-pole system (it’s rated for 3+ season use, meaning the tent can hold its own). We’re not convinced that all of the Base Camp’s updates are for the better, however. The interior floor space has been reduced by nearly 3 square feet, although this is partially offset by the more open pole structure. Further, the vestibules are smaller than before, which limits outside storage. But these are small nitpicks about a well-thought-out and versatile camping tent. 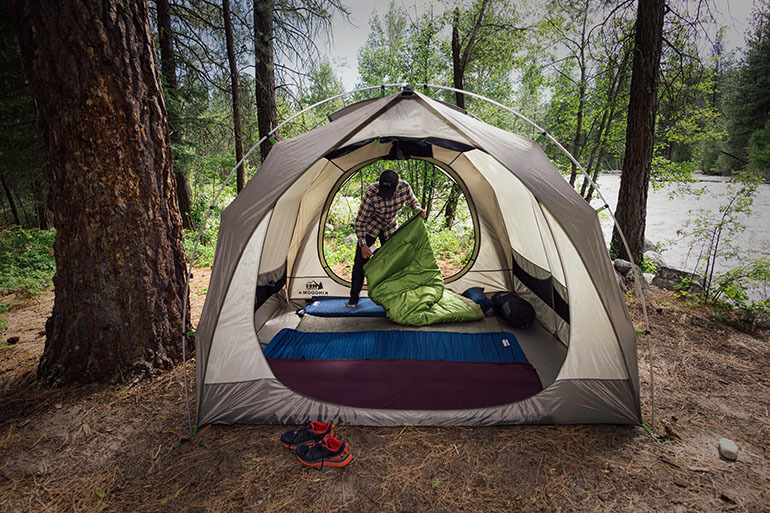 In addition to the Base Camp, REI has expanded its tent line with the Grand Hut, which offers even more livable space and a slightly lower price ($349 for the six person) at the compromise of weather protection. Weight: 26 lb. 8 oz. What we like: Almost like a second home. What we don’t: Not ready for bad weather. The Copper Canyon excels in one key area: its size. This mansion-like 3-season shelter is big enough for a group of six-foot adults to walk around in comfortably. All this space make it a prime choice cot sleepers, festival goers, and families with kids. And with a full mesh roof, air circulation is excellent in the Copper Canyon even with the rain fly on. The Eureka Copper Canyon is water resistant and the windows and doors zip up, but the rain fly only covers the mesh roof and doesn’t extend much further. Accordingly, those that might see sustained rainstorms like in the Pacific Northwest may want to opt for more protection. The tent walls also are essentially vertical, so it looks like a house—but one that’s been made of polyester fabric and fiberglass and steel poles. Use the guylines if the wind picks up to keep everything in one piece. Weight: 13 lb. 11 oz. What we like: Tall walls and airy feeling inside. What we don’t: Less weather worthy than the competition. Aptly named, the Big Agnes Big House Deluxe offers excellent interior space at a competitive price. The Big House was updated a couple years ago, and Big Agnes switched from a dome shape to a cabin style for improved roominess. The design is quite tall, with the sidewalls sloping upward aggressively to a peak height of 78 inches in the six-person model. Keep in mind that this extra real estate creates a sail-like effect in the wind, so make sure to stake the tent out completely and use the included guylines. 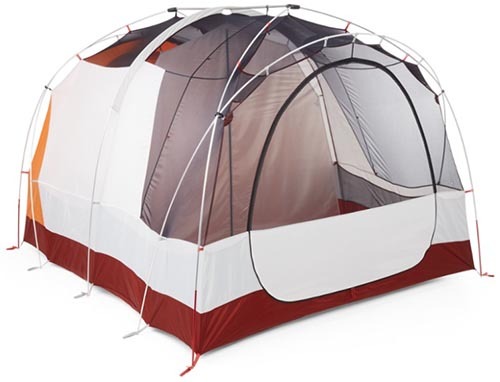 Offsetting mesh and polyester ripstop panels on the tent body make it a good ventilator, and with two doors on all versions, the Big House is a solid bargain starting at $400 for the six-person. You do miss out on a vestibule at that price, as the standard rainfly does not cover the front door. For extra storage, pick up the accessory vestibule that creates a front garage, similar to the REI Kingdom's system. Overall, we prefer the more weather-worthy designs from REI, Marmot, and Kelty above, but the Big House is still a compelling tent for those that camp in mild conditions and prioritize interior space. What we like: Fast set up and quality materials. What we don’t: Only partial coverage rainfly and very large packed size. For those that want a fast set up, tents that have the poles permanently attached can cut down on the total time substantially. Caddis isn’t the only company to use this quick pitch design but we think it’s the best on the market. 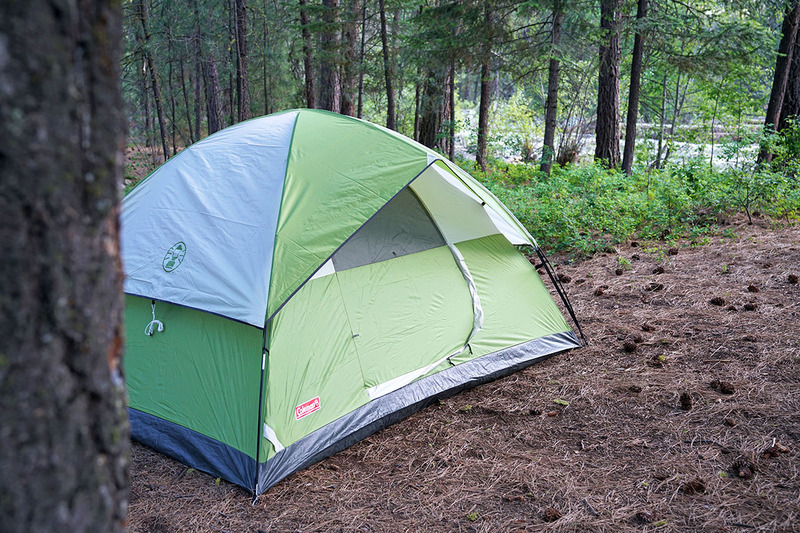 Unlike the popular Instant Tent from Coleman below, the hallmark feature of the Rapid 6 is the quality of materials. True, the poles are heavy steel, but everything else stacks up very well at this price point. It’s also massive inside, with 100 very usable square feet thanks to near vertical walls. What's not to like with the Rapid 6? The most significant is the rainfly, which only provides full coverage on two sides and doesn’t have any vestibule space. For fair weather camping, however, this shouldn’t be an issue for most people. Another downside is the very large packed size, and at 50 inches in length, it can be a challenge fitting into a full trunk. 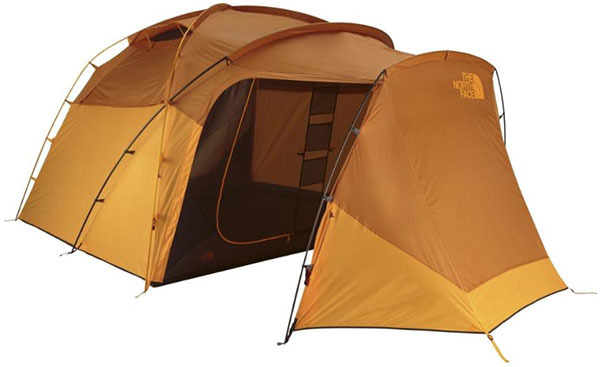 But if you want a tent with a fast set up and few compromises, the Rapid 6 is a great choice. Floor area: 60.6 sq. ft.
What we like: A true camping/backpacking hybrid. What we don’t: Heavy for backpacking. The MSR Papa Hubba and REI Half Dome on our list are true backpacking tents that can be used for camping, but Nemo has made a very interesting adaption with its four-person Losi. This tent is a true hybrid: the 4P Losi builds off the success of the two and three-person backpacking models, but adds significant interior floor space and height that is more akin to a camping tent. 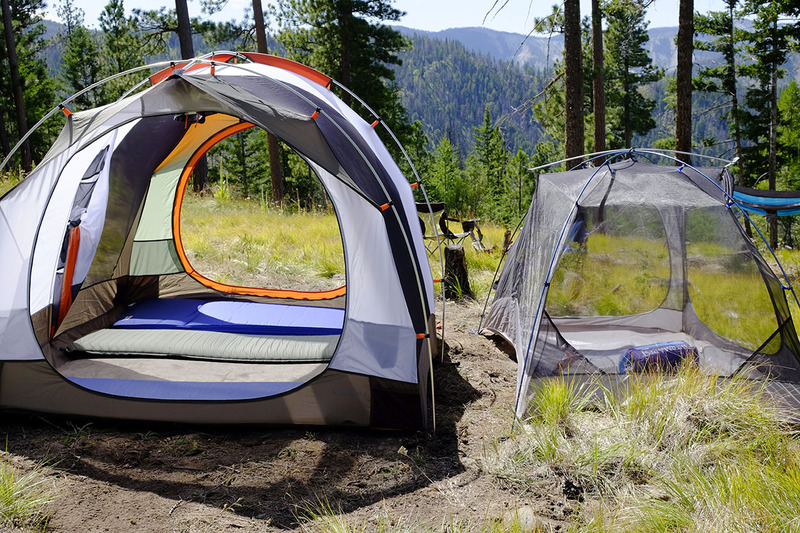 At under 10 pounds total, you can use this tent for car camping and it’s light enough to bring on backcountry adventures as well (not ideal, but light enough, and especially if you split up the components). Other good news is that Nemo’s build quality is very impressive. Compared to a tent like the Big Agnes Big House above, the Losi has better poles, more rigidity, and a higher-end feel. 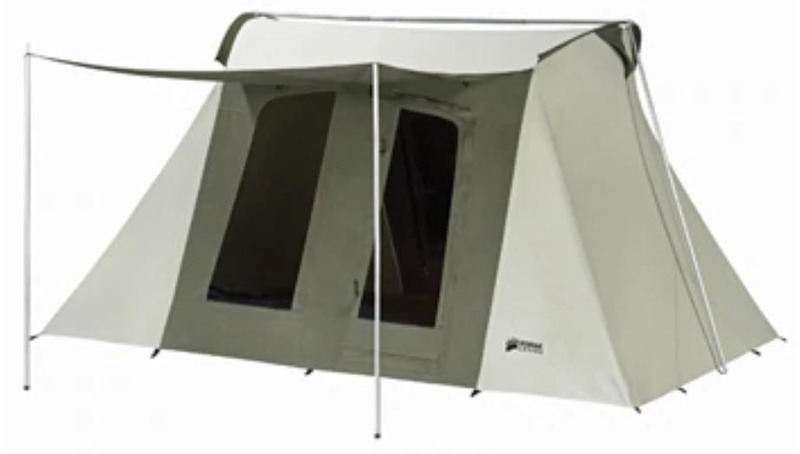 At 60.6 square feet of interior space and with a peak height of 60 inches, this is not the ideal tent for those who like to spend significant time under cover, but it’s cozy, well built, and the only true hybrid on this list. Floor area: 86.1 sq. ft.
What we like: Spacious interior and huge vestibule. What we don’t: Single-wall construction isn't as versatile as double wall. Products from The North Face languished in quality for years, but we’ve seen a noticeable bump in design and innovation of late. 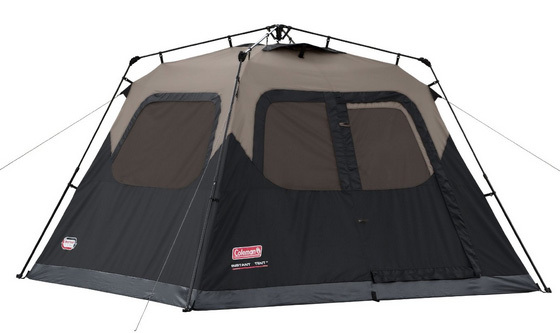 From their camping tent lineup, we like the Wawona’s mix of price, space, and durability. Made in four and six-person variations, we prefer the latter due to its large integrated vestibule. Looking a lot like REI’s Kingdom Mud Room accessory, the covered space includes a separate pole and wide opening for storing bikes or waiting out a rainstorm. 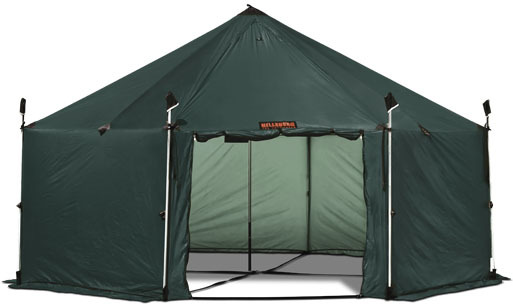 And where the Wawona further stands out is value: the tent undercuts REI’s Kingdom by over $100 if you include the cost of the Mud Room add-on. Why has the Wawona landed midpack on our list? The main culprit is its single-wall design. Instead of a separate tent body and rain fly like most of the options above, the Wawona is a single unit. This makes it easy to set up and take down, but the interior is prone to collecting moisture in humid or rainy weather and you can't remove the fly for stargazing. The North Face has incorporated large mesh windows, roof vents, and a mesh door to help, but the REI Kingdom is the more versatile year-round option. What we like: The canvas build is ultra-tough and weather resistant. What we don’t: Expensive, extremely heavy, and overkill for most casual campers. 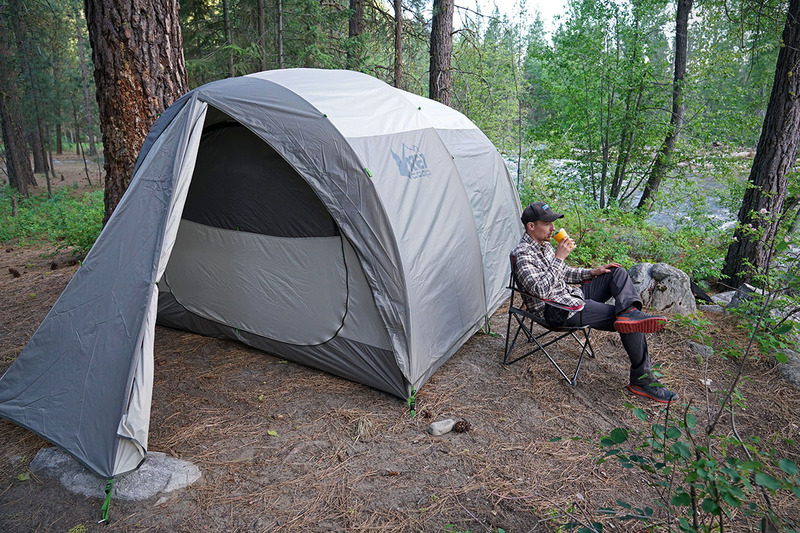 All of the other tents on this list are made with varying thicknesses of nylon and mesh, but the Kodiak Flex-Bow takes it to the next level with a unique canvas build. What does this mean for you? Canvas is known for being super tough: it can withstand heavy winds (the steel frame on this tent helps too), serious precipitation, and rough handling. Further, it does a good job of both trapping warmth when it’s cold and breathing when it’s warm. The Kodiak is also nicely appointed with large doors on each side, a relatively high 78-inch peak height, and decent ventilation. Simply put, the Kodiak Canvas Flex-Bow is a very solid all-season camping tent that can hold its own in most conditions. There are, however, a few notable downsides to canvas. First and foremost, this eight-person tent weighs a hefty 79 pounds and will take up a ton of space in your trunk or truck bed. It’s also one of the most expensive tents on this list at $650 (only rooftop tents and the Hilleberg Altai below cost more). Given these drawbacks, the Kodiak Flex-Bow certainly isn’t for everyone. That said, the tent is a favorite among the hunting crowd in particular, which makes sense given its build and feature set. But considering its roomy interior and weatherproof design, it’s an intriguing option for families and base campers too. 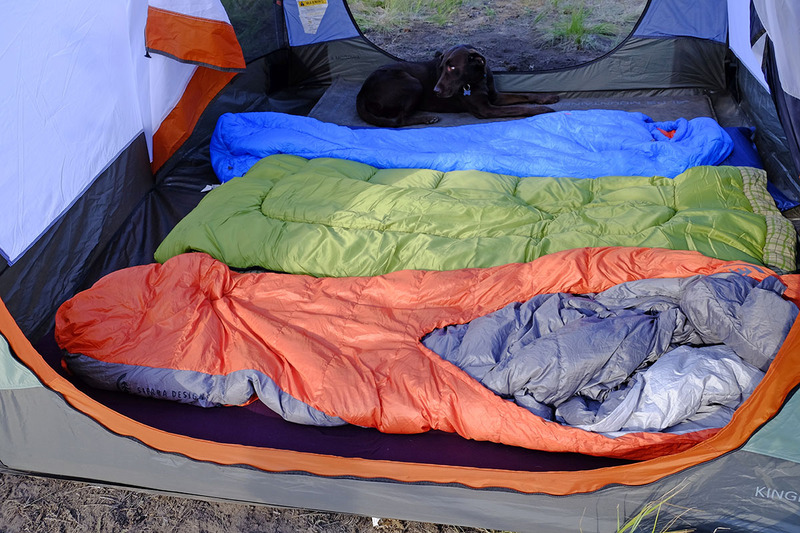 What we like: Lightweight and great for family backpacking. What we don’t: Expensive and cramped inside compared to true camping tents. Most of the tents on this list are strictly of the car camping variety, meaning they’re heavy enough that you won’t be carrying them more than a few steps from your vehicle. However, there is a whole different world of lightweight family tents that also can be taken into the backcountry. If you don’t mind sacrificing on things like interior space and thinner fabrics, a backpacking tent is a viable option for camping that could save you in the long run—no need to buy a separate backpacking tent when the time comes. To provide some context, the MSR Papa Hubba NX included here weighs less than 7 pounds for the four-person model, which is a fraction of many other tents on the list. Our top pick, the REI Kingdom, weighs over 20 pounds, and the Kodiak Canvas Flex-Bow Deluxe comes in at a whopping 79 pounds. 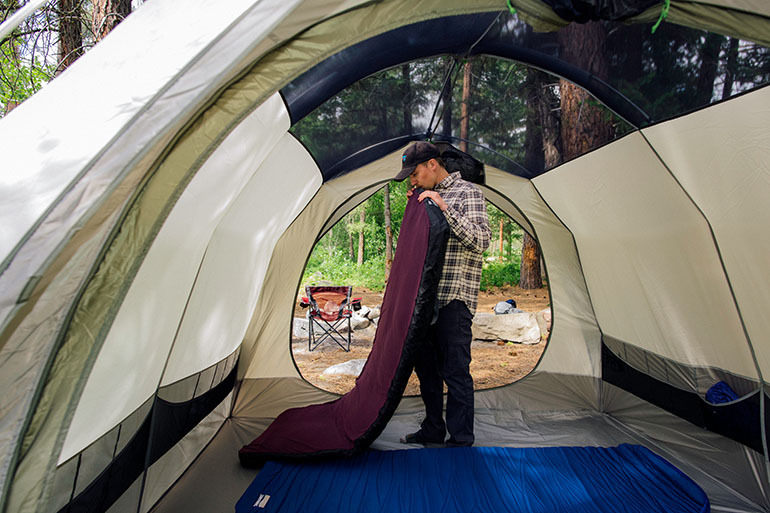 One sacrifice in cutting weight is interior space: with a peak height of just 44 inches and a relatively meager 53 feet of floor area, you’ll be using this tent more for sleeping and less for socializing. Finally, it’s worth noting that the fabrics on backpacking tents are much thinner, which is how they are so light, but this also means you have to take better care to avoid snags and tears. 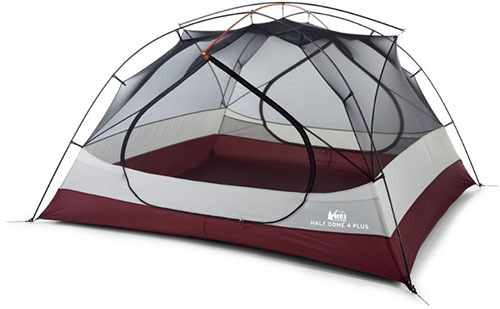 But for those looking for multiple uses out of their tent, we like the updated Papa Hubba NX. What we like: Cheap and easy to set up. What we don’t: Really should include the rainfly from the start. At the budget end of the spectrum, the Coleman Instant Tent offers ease of use and ample space for a family. The Instant Tent name comes from its pre-attached poles and incredibly basic setup—simply take the tent out the bag, make a few adjustments, and stake it in. For summer camping where wind and rain aren’t factors, this tent performs reasonably well and is a good value. The Instant Tent’s welded floors and inverted seams help keep water out and the tent now comes with a rainfly (the previous version did not), which is a welcome addition. That said, the fly barely covers the top of the tent, functioning more like a hat than a comprehensive weather barrier. Among our budget options, we prefer Coleman’s Sundome, which is lighter and less bulky to pack, includes a more useful feature set, and costs about $30 less. But if convenient set up is a determining factor—and the Caddis’s $280 price tag is too steep—the Instant Tent is worth a look. Weight: 11 lb. 4 oz. What we like: Living the yurt life. What we don’t: Low on the practicality scale for most car campers. Just about every camper goes for a classic dome or cabin-style tent, but why not a yurt? Legendary Swedish tentmaker Hilleberg has created an intriguing and offbeat option with the Altai XP, which essentially amounts to a lightweight and portable yurt for a little over $1,000. And if you know anything about Hilleberg—they make some of the finest backpacking tents on the planet—it’s going to be very well thought out and built to last. Caveat emptor: We don’t want to play up the Hilleberg Altai too much. It’s a specialty tent designed mostly for basecamping in alpine conditions and is not something you’ll often see around your average state park campground. Moreover, the $1,075 price tag is only for the exterior tent. 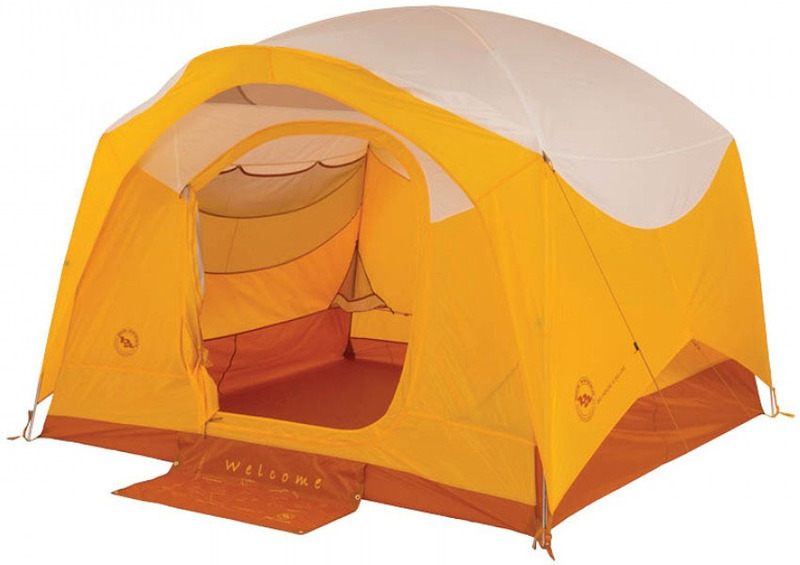 The inner tent—which you’ll certainly want for any real weather—is a $410 add-on and the floor is another $200. But around $1,685 all-in isn’t all that bad for such a cool set-up. If you feel the urge to be different, buck the trend and go for a yurt. How Many People Actually Fit in These Tents? Premium may seem like a generous term for a tent, but considering the price and feature set, they’ve earned the billing. Tents at this price point have the benefit of more extensive R&D and access to advanced materials, which leads to a more thoughtful design. To start, tents in this mid and high-end category make the most of their livable space—near-vertical walls, dividers, and spacious vestibules are a few examples. 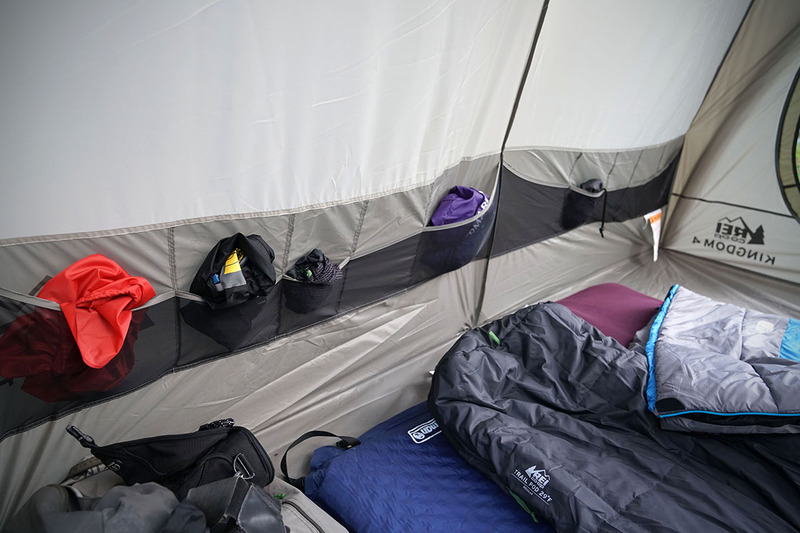 Liberal use of mesh in the tent body ventilates well in warm or muggy weather, and built-in vents in the rainfly help keep moisture from collecting on the inside. In addition, most of these tents can withstand wind and wet weather far better than budget options. Nearly all premium models have a full coverage rainfly (or at least the option) and a strong pole design. It’s true, a tent like our top-rated REI Co-op Kingdom can become prohibitively expensive (the eight-person model is $549), but for the family or group that heads out a number of times a year, even in bad weather, the long-term investment is a worthwhile decision. In theory, camping is a way to simplify life and just disconnect for a while. In that spirit, budget camping tents are basic but fully functional options for fair weather campers. There isn’t a clear line where a tent goes from mid-range to budget, but we’ve found for six-person options, it happens around $200. Typical budget tents use heavier fabrics, which make them bulky and adds weight to the bottom line, but they’re also durable and resist moisture. Weather resistance is their downfall. When a storm blows through the campsite, more often than not, the budget tents are the ones in a heap of broken poles. If camping is a new thing or you keep it casual in the summer, a budget tent will serve your needs just fine. Just don’t expect anything heroic if the weather turns sour. As you’ve probably deduced, even tents in the budget category can be a significant investment. And if you’re thinking about both camping and backpacking, the math quickly gets out of hand. If you’re only planning on doing both a couple times a year with the family, it may be worth considering a hybrid camping and backpacking tent. 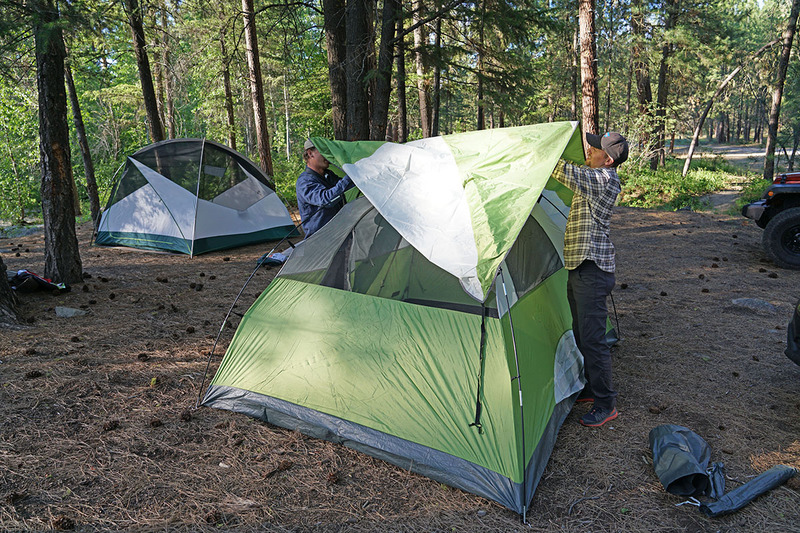 Depending on your space needs, you could get a tent like the REI Co-op Half Dome 4 Plus, which will fit four pads side-by-side (and is very roomy for two or three people). It’s small and light enough to manage on an overnight backpacking trip but still has enough space to make most campers happy. Tents that are trying to appeal to both parties will have some sacrifices. For campers, the Half Dome 4 has a low peak height and is built with lightweight and less durable fabrics to make it easier to pack down. But if you need something to pull double-duty, a hybrid camping/backpacking tent like the Half Dome 4 or MSR Papa Hubba NX is a great pick up. An up-and-coming category in the car camping world is rooftop tents. The concept is fairly simple: a folded tent attaches directly to the roof rack system on top of your vehicle or pickup bed, and when you arrive at your chosen destination, you simply unfold it, climb the ladder, and go to sleep. Compared with standard camping tents, the rooftop design gets you off uneven ground and makes it easier to set up camp just about anywhere (within reason). Moreover, most rooftop tents include a cushy built-in mattress, which is a notable upgrade from a standard sleeping pad. There are, however, a few downsides of rooftop tents to be aware of. First, they are very expensive—often $1,000 or more—and this price doesn’t include a roof rack system if you don’t already have one (even if you have a roof rack, we recommend using the fit guides provided by the tent manufacturers). Storing the tent at home also can be an issue. The Yakima SkyRise 3 above, for example, weighs 115 pounds and is wider than a full-size mattress. Further, rooftop tents take up a ton of space while mounted, often eliminating the possibility of also utilizing a cargo box or bike rack. But Tepui did recently release the HyBox for 2019, a hybrid roof box and tent that may solve that issue. Canvas tents, like the Kodiak Canvas Flex-Bow mentioned above, have a dedicated following and for good reason. Canvas is much more durable than nylon and other synthetics and also offers impressive weather protection. That said, it also weighs and costs significantly more. For example, the six-person Flex-Bow weighs a whopping 79 pounds and comes in at $650 (our top pick, the REI Co-op Kingdom 6, is a little over 20 pounds and $469). But the good news is that if you’re set on canvas, you likely won’t have to buy another tent for a very long time. Nearly every tent on the market will provide information about floor dimensions (or floor area) as well as peak height. This is helpful for understanding the basic design of the tent—the peak height in particular is an indication of whether or not you’ll be able to stand upright—but it only tells a part of the story. In general, tents with similar sleeping capacities will have similar total floor areas (80 to 90 square feet for a six-person model), and most car camping-style tents have a peak height of around 72 inches. Where the tents will differ is their true livable space, which is dependent on the slope of the walls and pole design. Dome tents with simple x-shaped pole structures only allow you to enjoy that peak height at the middle of the tent. On the other hand, a tent with a more advanced pole system can create nearly vertical walls for walking around. This is one of the main reasons we love the REI Kingdom and Marmot Limestone: both ends of the tents have vertical walls, and the pole designs truly opens up the interior. The cabin-style Eureka Copper Canyon and Big Agnes Big House are other standouts in maximizing interior space. The tents above are given a “_ person” capacity, which typically ranges from four to eight people. This listing is based on the number of standard adult sleeping pads that can be laid side-by-side inside the tent. For example, the six-person REI Co-op Kingdom is 120-inches long, so six standard pads (20-inches wide) technically will fit. But this doesn’t mean you necessarily want to max out your tent. If you use wide sleeping pads or air mattresses, or just want a little space to move around, we highly recommend sizing up. From our experiences, nobody wants to sleep in a tent that is jammed to capacity, so it’s best to order a slightly larger size than the actual number of people you have in your party. For example, a group of four should sleep comfortably in a six-person tent, leaving enough living space for playing cards, waiting out a storm, and spreading out while sleeping. And many couples and those with pets prefer a four-person model, which gives you plenty of room to stretch out. For a large capacity camping tent, we unabashedly prefer two doors. The additional access is convenient if you have a full house, and zipping it open is another way to encourage airflow in summer heat. A single door build is one of the notable downsides of budget-oriented models like the Kelty Discovery, Coleman Instant Tent, and Coleman Sundome. Stumbling and crawling over your tent mates in the middle of the night isn’t the best way to keep everyone happy. The very large openings on these tents do alleviate a little of the annoyance, but it’s still a compromise that’s worth considering when looking at a cheap tent. There differences in build quality are noticeable between budget and premium camping tents. Spending more gets you higher quality materials that are stronger relative to their weight, and in theory, should have a longer lifespan. But a good number of campers only make it out once or twice a year—and often in nice weather—which makes spending $400-plus unappealing. There’s a reason campsites are often dotted with Coleman tents: they’re affordable, roomy inside, and simple to set up and use. If you do plan to camp a lot, are looking for a long-term investment that should last for multiple years, or prefer quality gear, we recommending going for a premium camping tent. Upgraded features like a full coverage rainfly, large vestibules and lots of interior pockets for gear storage, and strong aluminum poles increase a tent’s functionality and weather resistance. A tent like our #1 ranked REI Co-op Kingdom is the whole package—we have a first generation Kingdom that has been through the ringer and still is going strong. 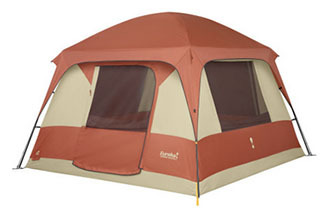 But those who plan on camping only infrequently can get away with a budget model like the Coleman Sundome just fine. As we touched on in the section above, a weather-worthy tent is one of the main reasons to upgrade to a premium camping model. In most cases, the pole materials (aluminum is better than fiberglass) and designs are more robust, seam sealing and waterproof fabrics improve in quality, and the inclusion of full coverage rainflies help keep out blowing rain. It's good to keep in mind that the weather can still get plenty rowdy in the summer, particularly in the mountains (and national parks). 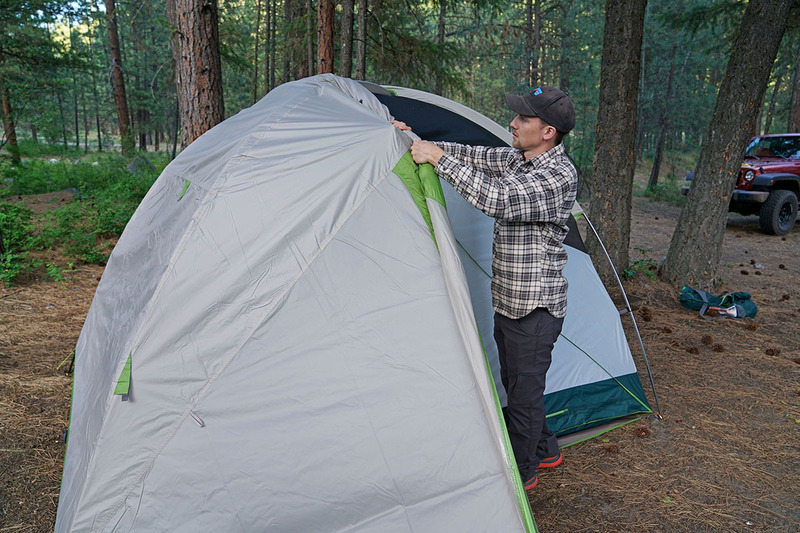 Two of the strongest tents on the list are the REI Co-op Base Camp and Cabela's Alaskan Guide Model, which utilize advanced pole designs that are inspired from mountaineering tents. The Cabela's can even be used for snow camping in less extreme conditions (for designs meant to withstand serious winter weather, check out our article on the best 4-season tents). For most 3-season trips, any tent from our premium camping list should do the trick, if it’s been properly staked out (and if the wind picks up, take the time to align the tent and guylines to brace against the wind). Weather resistance isn’t simply about withstanding wind or rain—the hot summer months bring their fair share of challenges. A tent that is hot and muggy at night can be just as miserable as a rain soaked tent—and either way, don’t expect much sleep. For a tent to perform well in these conditions it needs to ventilate well, so look for healthy swaths of mesh. While a lot of mesh impacts privacy with the rainfly off, the increased airflow is without a doubt worth the tradeoff. If you need to use the rainfly, look for features like roof vents that help expel heat (and the moisture from your breath) or the option to roll up the sides when the rain isn't coming at you sideways to keep your occupants reasonably comfortable. A full coverage rainfly that protects the door(s) of a tent creates a space in front of those doors, referred to as a vestibule. We’ve found a wide range of uses for a vestibule, but a few highlights include a spot to store gear away from rain and putting on/taking off shoes. If you don’t have a car close by to store your stuff, a vestibule should be on your must-have list. Taking the concept of a vestibule to the extreme is REI’s Kingdom Mud Room. The palatial pole-supported structure extends out for an additional 61 square feet of space, enough for a card table or area to store bikes. Also, you can zip up the entry door and roll up the sides to create an open and airy shelter from the sun or light rain. A quick look at the table above shows a wide range in the total weight of our recommended camping tents. On the lightweight end is a backpacking-friendly design like the MSR Papa Hubba NX at 6.5 pounds, while a large 6 or 8-person camping model will easily break 20 pounds. For car camping, the extra weight doesn’t mean a whole lot, but if you’re unable to drive up to your campsite, it’s worth considering total weight. And if you’re looking for an all-in-one hybrid camping and backpacking model, we recommend choosing a tent that weighs less than 10 pounds. Divided between a few people, that’s an acceptable amount of weight for casual weekend or overnight backpacking trips. The packed size of the tent will typically align with its weight. 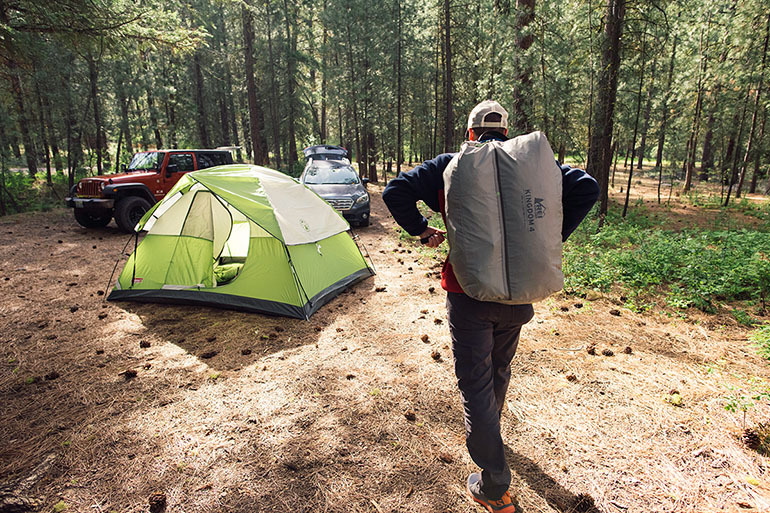 Hybrid backpacking and camping tents pack down the smallest (the Papa Hubba measures 7 x 21 inches), while a tent like the Coleman Instant Tent will fill up an extra-large duffel bag and take up a good portion of a car trunk. Again, if you have the space to store it and haul it around, this isn’t a big downside, but if either are at a premium, we recommend a more compact hybrid design. When choosing between tent models, it’s a good idea to take the total footprint or ground size of the tent into account—some of the 6 and 8-person models are absolutely massive. Factoring in some of the large vestibules or “garages” that can be tacked on to the end of a tent, there’s a strong likelihood that it will extend beyond the size of the raised pads at some national parks or campgrounds. If you come from a backpacking background, many car camping tents require a much larger swath of ground. It’s not uncommon for a raised camping pad to be 10 or 11 feet long, which is a tight squeeze for a tent like the REI Kingdom 6 (10 feet not including the vestibule). Typically, however, most locations have large pads available, so we wouldn’t recommend downsizing your tent out of fear of not finding a suitable space. But it’s not a bad idea to check out the dimensions of the campsites you plan on visiting and upgrade to a bigger space if possible. And if you have any doubts or want to use your tent in smaller spots, we recommend going with a hybrid or backpacking model that has a smaller footprint. While not a requirement, it's a good idea to use some type of footprint or ground cloth when camping. The extra layer protects the tent’s floor, thus extending the tent’s overall lifespan. But do you need to spend the big bucks and get the one specifically made for the tent? Oftentimes those are upwards of $50, which feels like a lot for a single sheet of fabric and some webbing. The advantage of using the footprint specifically designed for the tent is that it’s precut to the proper dimensions and the grommets will attach to the tent poles directly. It’s an integrated system that you don’t need to worry about. Alternatively, a decent tarp can suffice for ground protection as long as there’s still space to store it in your vehicle. They are typically quite large, and if you don’t want to cut them up, you’ll need to layer or stuff the excess material under the tent floor, creating some uncomfortable lumps. Another popular choice for making a generic ground cloth is picking up bulk Tyvek. This relatively thin and packable material is cheap and offers sufficient protection. No matter your choice, if you decide to trim the ground cloth, make sure to measure in a few inches in all dimensions to guarantee you don’t have fabric hanging out the sides of the tent floor. This extra material sticking out can collect and pool rain water and compromise your waterproof shelter. 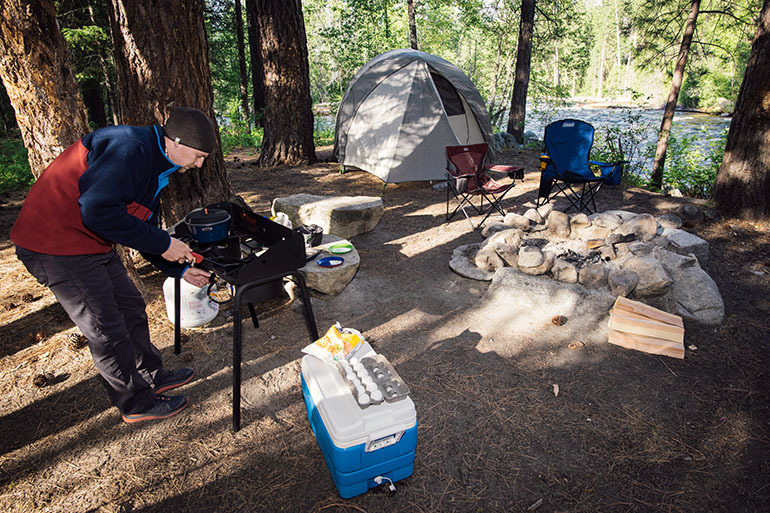 Since you’re essentially setting up a home away from home, camping can be heavy on gear. Tents are typically your biggest purchase—both in price and size—followed by items like camping pads or mattresses and sleeping bags. Depending on where you’ll be camping and for how long, other essentials include a gas-burning stove and camping chairs. The beauty in all of this is that the same principles that apply to camping tents transfer to the rest of your gear. You can go cheap and still have a great time, but you’ll rarely regret spending extra for added comfort, performance, and longevity.